What actions can entrepreneurs take to not only raise money to finance their enterprise but as importantly—help L. American investors to see beyond the financial rewards of investing in just their company—& finance other ventures in the entrepreneurial community? By achieving this outcome entrepreneurs not only secure their future, but they impact the DNA of domestic capital to invest the cash required to ‘Scale Up’ start-up communities. While it’s challenging to startup a start-up community, it’s even more difficult to build the legs required for entrepreneurial communities to achieve sustainability. Business survival requires entrepreneurs to create business models which customers demand. But you must think beyond just customers and ‘shape’ your business model to the behavior of local wealth to risk too. Until investors understand and ‘buy’ the risk in start-ups and early stage SMEs, too little capital will flow to entrepreneurs in Latin America vs. the amounts available for investment. Too often I see entrepreneurs attempting to ‘shape’ investors’ behavior to risk as their strategy to raise capital, but such actions rarely succeed. Rejected at home, many label domestic capital as too conservative and they hop on the next plane to Silicon Valley. A few raise money but most don’t, and return home facing an unknown future. Yet this belief which drove founders to the USA—that domestic capital in L. America is too risk adverse for venture stage SMEs—is false and misguided. 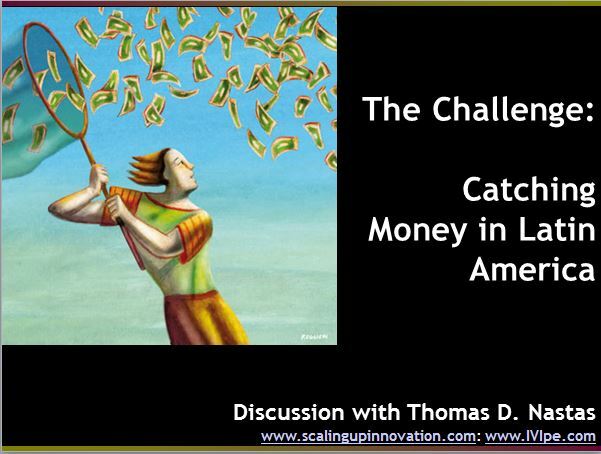 View solutions to raise L. American money here (PDF). For those fluent in Spanish, you can view my presentation as a video with a Spanish translation voice-over. This event was hosted by the Ministry of Production, Government of Peru. I thank Vice Minister Francisco Grippa and his trusted colleague Enrique Aldave, Director—General Directorate of Innovation, Technology Transfer & Business Services for their invitation. Event attendees included representatives from APEC member countries & staffers from multiple branches of the Government of Peru, Peruvian entrepreneurs, investors (+ investment support organizations), universities, the media, and entrepreneurial support organizations. Entrepreneurs from Chile, Columbia, Korea, Malaysia, Mexico and the Philippines attended too.